Welcome to the 6th annual Feria del Libro: A Family Book Fair web site. 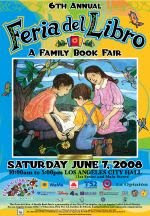 The book fair is held on Saturday, June 7, 2008 on the grounds of the Los Angeles City Hall from 10 am to 5 pm. Be ready to enjoy a fun-filled day with literacy related activities, entertainment, authors, books, and much more. Many people use the city’s mass transit system to travel to the feria, others come by car and park in the many parking lots in the area, others take shuttle busses from their local schools (ask your principal), and others walk or ride their bicycle. However you travel, be sure to be there! The Feria del Libro: A Family Book Fair is a community-wide event promoting a culture of literacy at home and academic achievement at school, where quality culturally-relevant books are available to children of all ages. The book fair had its beginning 2003 when the Boyle Heights Learning Collaborative, the LAUSD Roosevelt family of schools, and Families In Schools decided to be pro-active in making books available to families in Boyle Heights, a community with limited access to bookstores and libraries. The book fair has grown ten-fold since 2003, when the fair attracted over 3,000 people. In 2007, the audience grew to over 35,000 youth of all ages and their families who joined in the celebration of books and reading on the steps of City Hall and the surrounding streets.. One of the very exciting highlights of the event is when students are recognized for being the Million Word Challenge winners from their schools and each of them receives a $50 gift card to purchase books at the fair. This community-wide event is produced through a unique partnership of the Los Angeles Unified School District, the City of Los Angeles, Families In Schools, the Los Angeles County Office of Education and First 5 LA. The partnership, with the support of the generous corporate sponsors, works to promote reading as an important activity in every home in our community. Congratulations to the International Latino Book Award Winners! 2nd Place: OOOMMM-MMMOOO Yoga para niños - Maria Villegas/Jennie Kent – Villegas Editores S.A. Honorable Mention: !Sentimentos! - Patricia Geis - Combel Editorial, S.A.
Juan Cardenas - Alvaro Medina - Villegas Editores S.A.
2nd Place: Luis Caballero - Antonio Caballero - Villegas Editores S.A.
2nd Place: La Comida de Francia - Maria Villegas/Sarah Randell - Villegas Editores S.A.
Hegemonía e Imperio - Alfredo Toro Hardy - Villegas Editores S.A.
LOWE - Benjamin Villegas/Andrea Velez/Mauricio Moreno - Villegas Editores S.A.
Luis Restrepo Construcciones - Benjamin Villegas/Andrea Velez/Pablo Rojas - Villegas Editores S.A.
2nd Place: Luis Caballero - Benjamin Villegas/Enrique Coronado - Villegas Editores S.A.
Caballo Alado Clásico Al Galope 2 - Combel Editorial, S.A.
2nd Place: Caballo Alado Clásico Al Paso 2 - Combel Editorial, S.A. Honorable Mention: Caballo Alado Clásico Al Trote 2 - Combel Editorial, S.A.
Fútbol en Colombia - Carolina Jaramillo Seligmann - Villegas Editores S.A. Thanks for the list! It'll come in very handy.